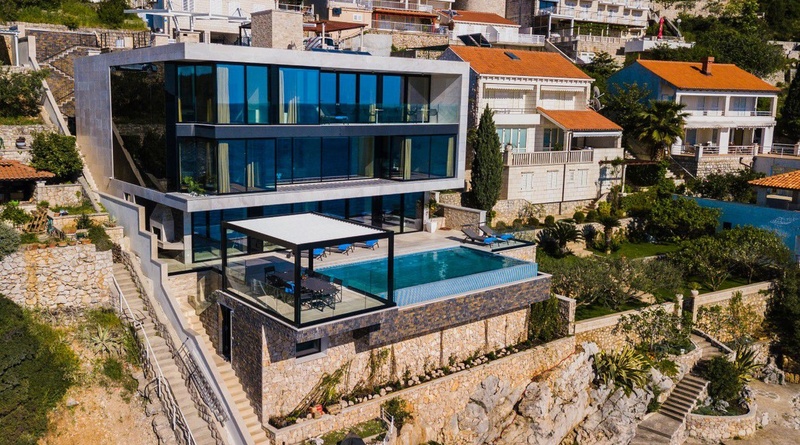 Villa Starlight Dubrovnik features 5 double bedrooms, 2 adjacent apartment units, 8 bathrooms + 1 toilet and offers accommodation for 14 guests. With superb plot over 500 square meters overlooking surrounding islands and sparkling Adriatic sea, villa Starlight offers you complete privacy and comfort. The front facade is full glass, designed to emphasize view and bring in natural light. Right in front of the villa, there is a large infinity pool and outdoor dining area under the eaves. Hidden to the side, a fireplace with grill offers a natural gathering space for friends and family to prepare meals and enjoy each other’s company. This magnificent villa spreads over imposing 700 square meters over 3 levels and has a smaller structure in the back. The ground floor is an open-plan area that consists of a living room, dining room and kitchen in the back. A great feature is floor-to-ceiling windows that give the impression of being outside even while you are enjoying a cup of tea inside. Furthermore, it provides you breathtaking views and floods the space with natural light. There is a villa manager at guest’s disposal 24/7, private parking and private beach in addition to this remarkable villa. All together in Villa Starlight Dubrovnik, you’ll get exceptional experience and everlasting memories of your villa vacation in Dubrovnik. Please note that the price for the 7th bedroom is at an additional surcharge.